England's first game since last year's World Cup will be against Fiji or Samoa in the Four Nations Series in Brisbane on 25 October. 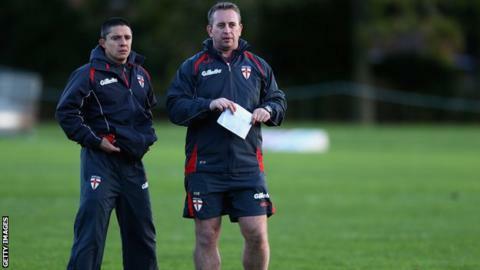 Steve McNamara's side were knocked out of the World Cup semi-finals by New Zealand in November. England also come up against joint hosts Australia and New Zealand as they attempt to reach the final in Wellington on 15 November. Fiji and Samoa play off in Penrith on 3 May for the fourth spot. McNamara said: "Clearly the backbone of the Four Nations squad will come from the World Cup but there are plenty of exciting opportunities for players who have been in form in Super League. "Rather than dwell on what we didn't achieve, we want to put ourselves in the best position to do well in the Four Nations." Saturday, 15 November - Final (Westpac Stadium, Wellington).